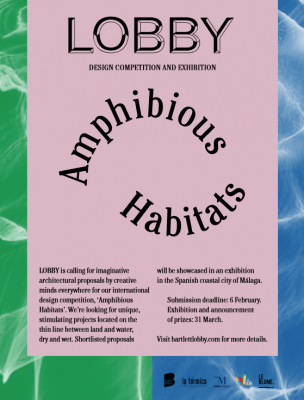 This spring, LOBBY is calling for unique, inventive architectural proposals as we excitedly announce the launch of our first international design competition: ‘Amphibious Habitats’. Throughout the years, LOBBY magazine, initially intended to be a voice for Bartlett School of Architecture students, evolved into an international forum for discussion, critique and celebration of architecture, working with a remarkable number of writers, thinkers, designers, photographers, illustrators, students and architects from around the globe. We want to keep exploring these collaborations by engaging with diverse communities from different countries and by giving new designers the space to showcase their work, outside of the printed pages of the magazine, in a diverse and dynamic event. ‘Amphibious Habitats’ is open to designers, architects, students, artists and creative minds everywhere who are bursting with imagination and wit, and who want to wander through the thin line between land and water. The Spanish city of Malaga has a social and cultural identity strongly shaped by its proximity to the sea and by a brief but intense industrial splendour which started almost a hundred years ago. Its local industries have heavily relied on water for energy, cooling and waste disposal, while also being an important part of local pastime activities. Over the years, this dichotomy has established a unique relationship to the sea, at once place for leisure and productive resource. Today this relation is still visible within the few industrial remains that decorate and distinguish Malaga’s coastline: chimneys, old warehouses, abandoned railways and other elements constituting a built filter between city and water. With this in mind, ‘Amphibious Habitats’ calls for designs that challenge the very distinction between land and sea, looking to generate architectural ‘artefacts’ that act on this threshold—neither purely marine nor land, but instead both at the same time. The proposals should establish innovative ways to understand and appropriate the often undefined and always changing space between these two natures. Although Malaga will act as the ideal cultural frame for the competition, designs should be freely imagined as objects of reverie which might take cue and inspiration from sources distant in time and space. Fifteenth century artist Hieronymus Bosch seem to be especially inspiring, as he provided us with some of the most fantastic, dreamlike and often nightmarish visions of such amphibious, multi-elemental and meta-human architectures, operating between objects and spaces, machines and living beings, land and sea. Proposals must respond to topographic conditions, whether real or imagined: rocky cliffs, sandy beaches, volcanic tide pools, coral reefs, Icelandic or equatorial shorelines, imposing sea banks; the list could go on. We are looking for architectures that find their raison d’être on these boundaries between dry and wet. These objects will engage its users in original and unexpected ways, questioning our relationship with water and at the same time promoting new ways to understand the land-sea binomial. As Bosch’s unique paintings suggest, the designs we are looking for should be daring, bizarre, odd, surreal, strange, eccentric, unconventional, visionary, imaginative, prophetic, outlandish and provocative. We’re looking for proposals at once inspiring and disturbing, possible and impossible, and always land and marine. 	6 February: deadline for submitting design proposals. These should describe the project in the most clear and engaging way possible. Proposals submitted at this first stage should consist in a digital A3 file (Jpeg or Pdf) of no more than 10mb in size. One single, eye-catching view of the artefact (axonometric, perspective, elevation etc.) should occupy the entirety of the A2. Any technique of representation (sketch, rendering, collage, watercolour etc.) is accepted. The file should not include any of the team members’ names (teams can be formed by up to three members) nor any descriptive, explanatory or other type of text. It should instead only feature a title for the project, clearly readable (and preferably memorable and unique). The names of participants, together with their institution (if applicable), should only appear on the text of the email. Submissions should be sent to submissions@bartlettlobby.com. 	10 February: we will shortlist up to 20 projects based on their proposals. They will be contacted directly and informed of our decision. 	4 March: deadline for sending model image of shortlisted design. Selected teams will have until then to build a model of their proposed project and to send us a zip file with between 5-10 pictures of it. Together with the pictures, they will send us a 250-word ‘manifesto’ of their project, introducing their design ideas and briefly illustrating its purpose. The text can be written in Spanish or English. Models built in this second phase of the competition should not exceed 50x50x50cm in size. Teams are free to choose the scale of the model as well as the material(s) to use. Pictures of the model (Jpeg) and the text (Word or Pdf) should be sent to submissions@bartlettlobby.com. We will be in contact with each team with feedback. Teams will be contacted individually and invited to present their projects in Malaga on 31 March at the cultural space La Térmica (www.latermicamalaga.com). Special attention will be paid to the character and quality of the models, as well as to how they reflect the relationship with the users and with its land/marine context (see Selection Process for details). 	20 March: deadline for models to arrive in Malaga, in case participants will not able to attend the event on 31 March. Information on how and where to mail the models will be provided in due time. 	31 March: Event date. A one-day event will take place at La Térmica. Projects (both drawings, models and their accompanying texts) will be displayed in an exhibition open to the public, running all day long. – A panel with three lectures by local and international guests. Topics will include the architectural nature of Malaga’s post-industrial heritage, the relationship between the city and sea, ways for architects to address notions of maritime culture. – A jury of selected guests will proceed to nominate up to three winning projects. Winners will be announced and will be awarded prizes. – ‘Amphibious Habitats’ will close, in true LOBBY style, with a beautiful, energetic courtyard party with drinks, music and food at La Térmica. The party is open to the general public, setting the ground for a truly artistic, cultural event. 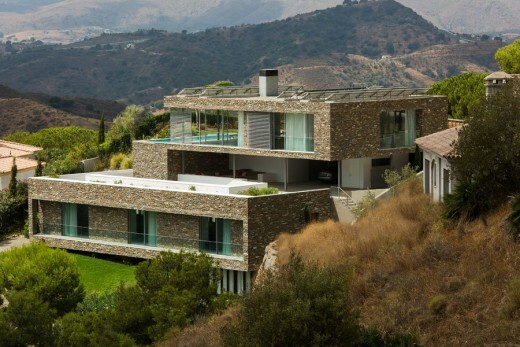 	How projects challenge relationships between land and sea. The designed artefacts will stand at the very threshold between these two elements and should focus on promoting a re-thinking of their balance. The proposed designs should ultimately establish new ways to approach and understand the shore and its surroundings. 	How designs involve its users in unusual, unexpected ways. Designs can be moveable and dynamic. They should include unexpected, non-traditional architectural elements which can directly engage their audience. 	Because the final products of the competition will be displayed in an open exhibition, special attention will also be paid to the character, identity and ‘style’ of the models, as well as to the material quality of both models and drawings. Any material, technique and technology is accepted, as long as it reflects the guidelines and goal of the competition.